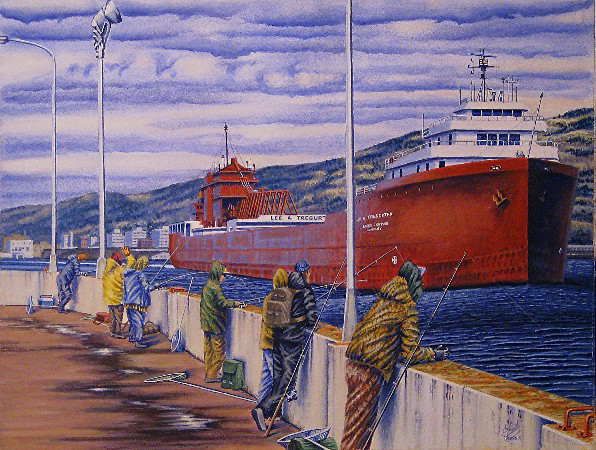 Fishermen on the South Pier of the Duluth Ship Canal in Duluth, MN brave a cold April day in the quest for the elusive northern pike. Only a few northern pike had been caught up until this time, ranging from 3-5 lbs., including the one that was on at the time as the 826’ M/V Lee A. Tregurtha blew its salute to the Aerial Lift Bridge of 1 long and 2 short whistle blasts. With the Interlake Steamship Co. vessel outbound with coal loaded at Midwest Energy in Superior, WI for Minnesota Power’s generating plant at Taconite Harbor, MN, one of the fisherman exchanges a friendly hand wave with one of the deck officers in the Tregurtha’s bow as the Bridge returns the Master's Salute. As the Tregurtha passes by, some of the fishermen may notice the World War II battle ribbons proudly displayed on the pilothouse, evidence of meritorious service in both the Atlantic and Pacific theaters.